A Product by Chemtex Speciality Ltd. Reverse Osmosis or Hyper-filtration is the most efficient form of water purification. This process plant follows a general pathway consisting of ion exchange, filtration, reverse osmosis, chemical treatments/ disinfection. The end product is used for both commercial and residential purposes therefore requiring a greater level of sanitation. 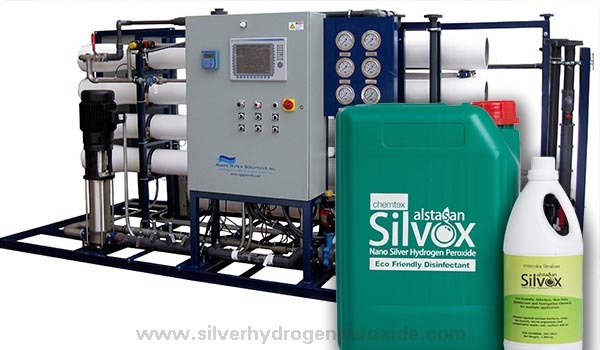 ALSTASAN SILVOX (Silver Hydrogen Peroxide based Biodegradable Disinfectant) addresses the following areas of concern of RO treatment plants without causing harmful/toxic effects. The silver hydrogen peroxide water treatment helps in achieving a long term effectiveness against any harmful pathogens. A recommended quantity of the product is added to water, rendering it safe for use. Some common waterborne diseases include typhoid, dysentery, cholera, etc. A dilution of this sanitizer can be used to safely spray on surfaces, or circulated through pipelines for an appropriate contact time. Surfaces are prone to gastrointestinal, cutaneous and respiratory diseases. This effective biocide is diluted at a given concentration and fumigated using a fogging machine to disinfect an area. Some common airborne diseases include flu, tuberculosis, measles, etc. I am interested in buying Silver Hydrogen Peroxide. Please send me a quotation for the same.